Happy Friday everyone! 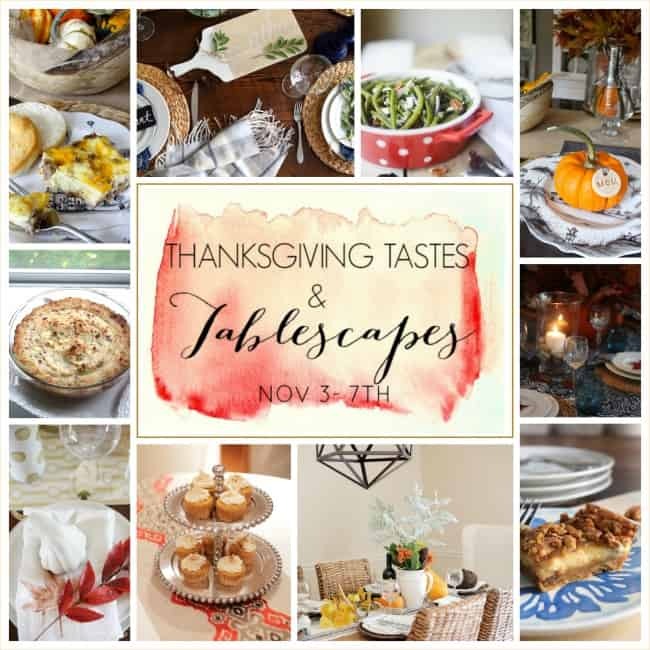 Today I’m teaming up with some extremely talented ladies and we’re showing off our Fall tablescapes just in time for Thanksgiving. We’re just a few weeks away, so we thought it might be fun to give you guys some inspiration along with a recipe or two. First I’ll start off with my Thanksgiving table setting. I have been LOVING our new dining room set up and especially loving my new light fixture from Wayfair (more on that later). This year I decided to go with some of the classic fall colors along with a touch of mint green. I wanted to keep it light and bright and stay away from a super heavy color scheme. Most of my accessories are from Target and Marshall’s, but what’s new, right? My salt and pepper shakers were on clearance at Target for about $1 each and my wicker pumpkins were found in the $1 section of Target for about $3 each. My fall leaves are also from Target and my napkins and table runner were found at Marshall’s. Follow the instructions on the cake box as if you’re making a normal vanilla cake. Preheat the oven to whatever temp. is directed on the box. Once your batter is mixed, add the can of pumpkin to the batter. I don’t always use the full can of pumpkin — maybe just 3/4 the can. Put 3/4 can of your cream cheese icing into a measuring cup and heat in the microwave for a slightly melted consistency. Once the icing is slightly melted, pour it into the batter. Yes, the icing is IN the batter!! YUM. Add your tablespoon of cinnamon, and you’re almost done. Mix everything together and you’re ready to pour the batter into your cupcake tin. Put your cupcakes in the oven and follow the cooking instructions from the cake mix. Once they are done cooking and cooled, use your second can of cream cheese icing to top them off! Looking for even more inspiration?? Don’t worry! All you have to do is check out the rest of the bloggers and see what they’ve got cooking… literally! I have to agree, your photography skills are excellent, photos are so clear, taken at angle to best show what you’re featuring. Love your blog Amy. Love that new light over your table. Thanks for sharing a great and delicious sounding recipe, easy too. Think I’d like to make those cupcakes for Thanksgiving. We’re hoping we’ll be invited to dinner at our daughter’s house. I’d like to have something yummy to take to contribute to the dinner, little extra. They all love my pecan pie but would love to have new treat. Our Target never seems to have the good stuff bloggers write about them having in $1 section, doggone it anyway. We used to buy the double section of Tootsie Rolls but they stopped them,loved those. So, so pretty and those cupcakes look amazing and how easy! I need to make those for sure! Amy your Thanksgiving table is so, so pretty! I love your pretty linens with the dark woven chargers and pumpkins at each place setting. And those cupcakes – yum! Definitely adding them to my Thanksgiving menu!! Delish. Thanks for sharing! Love that table and chairs! Are they from Wayfair? What brand?